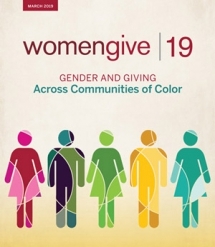 A new report from the Women’s Philanthropy Institute (WPI), Women Give 2019: Gender and Giving Across Communities of Color, offers insights on the intersection of race, giving, and gender. The study finds that generosity is a value shared by all communities, and that women across races and ethnicities are leading through philanthropy. The report found that households across all racial groups give to charity and a donor’s race does not have a significant effect on the amount given, after adjusting for factors such as wealth, income, and education. Gender patterns previously identified by WPI—specifically, that single women and married couples are more likely to give than single men—hold true within each of the communities studied (African American, Asian American, Hispanic/Latino, and White households were included in the analysis). The report, which is funded by a grant from the Bill & Melinda Gates Foundation, demonstrates the unique perspectives women of color bring to philanthropy and underscores the importance of understanding and engaging donors from diverse backgrounds. “Women Give 2019 highlights the universality of giving. Women in communities of color may take different pathways to their philanthropy—learning from their families or religious traditions, or starting to give later in life. But the act of giving their time, talent, and treasure is consistent for women across race and ethnicity,” said Debra J. Mesch, Ph.D., the Eileen Lamb O’Gara Chair in Women’s Philanthropy at the Indiana University Lilly Family School of Philanthropy at IUPUI. Households across all racial groups give. A substantial portion of all racial groups give to charity, and high net worth households are especially likely to give. Households across all racial groups give to similar causes, including both religious and secular causes. Religion and basic needs are the top two causes supported across race and income. A donor’s race does not have a significant effect on the amount given to charity, when taking income and other factors into account. When factors known to affect giving (such as wealth, income, and education) are taken into consideration, and giving is measured as a percentage of income, race does not appear to affect the amounts that households donate. Other demographics, such as income and wealth have a stronger impact on household giving amounts. “This year’s Women Give report raises awareness that the generous philanthropy that takes place in diverse communities often goes unrecognized. Women in communities of color can see themselves and their experiences reflected in this empirical research about generosity. To overcome outdated stereotypes of who a philanthropist is, the philanthropic sector must be more intentional about embracing and including diverse perspectives and approaches,” said Una Osili, Ph.D., associate dean for research and international programs and dean’s fellow for the Mays Family Institute on Diverse Philanthropy at the Lilly Family School of Philanthropy. Women Give 2019 uses data from both the Philanthropy Panel Study and from the U.S. Trust Study of High Net Worth Philanthropy; both studies are produced by the school. WPI also conducted case study interviews to supplement findings with real-life experiences of women philanthropists in communities of color. Across the board, the women described how their giving has been shaped by their racial and gender identities—and often by both at the same time. Women Give 2019 is the 10th in a series of signature research reports conducted at the Women’s Philanthropy Institute that focus on gender differences in giving to charitable organizations. Each report explores unique questions about the factors that shape gender-based giving patterns—including age, religion, income, marital status and more—in order to increase understanding about how gender influences philanthropy. In conjunction with the report release, WPI partnered with the YWCA Metropolitan Chicago and Facebook to create the “Who Is A Philanthropist?” video series, which spotlights how diverse women are giving back to their communities in unique ways. All are encouraged to join the #IAmAPhilanthropist conversation on social media. The Women’s Philanthropy Institute (WPI) is part of the Indiana University Lilly Family School of Philanthropy at IUPUI. WPI increases understanding of women’s philanthropy through rigorous research and education, interpreting and sharing these insights broadly to improve philanthropy. By addressing significant and groundbreaking research questions and translating that research into increased understanding and improvements in practice, WPI helps to leverage new and expanded resources for the common good. Follow WPI on Twitter and on Facebook. This research was produced thanks to a collaboration between WPI and the Mays Family Institute on Diverse Philanthropy. The Mays Institute fosters a greater understanding of the ways in which underrepresented people are both inspired and informed donors by providing knowledge, education and training.